We have 2 ranges for fixing shelters. The standard Erdanker anchors are the lowest cost and are ideal if the shelter is not going to be moved very often. The Low Profile Safety anchors can be used in all situations, mobile or fixed and are specifically designed for use near cattle and horses. 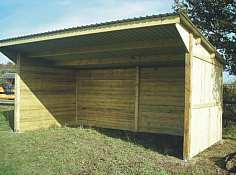 Mobile field shelters can be moved around, which is useful if the ground is soft and muddy as it helps the grass to grow. Also in most countries, no permission is needed unless concrete is used. The Groundbolt low profile, safety anchors are designed specifically for use near cattle, horses etc. 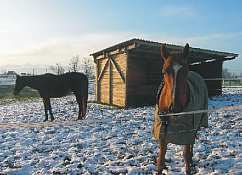 and are widely used in many countries for both fixed and mobile shelters and stables. Securing shelters with Low Profile safety anchors. 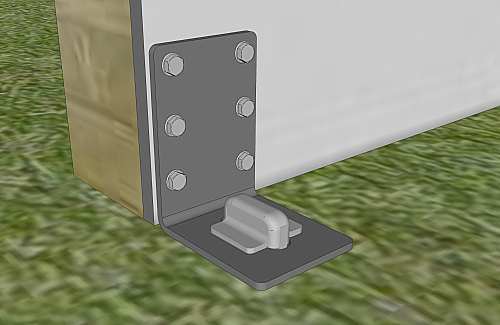 Firstly the T505 bracket is fixed to the shelter using bolts or large screws, then when the shelter is in position, the anchors are hammered through the slot in the brackets, the anchor will rotate when hammered, cutting a thread in the ground. The slot in the bracket prevents any unwanted rotation. 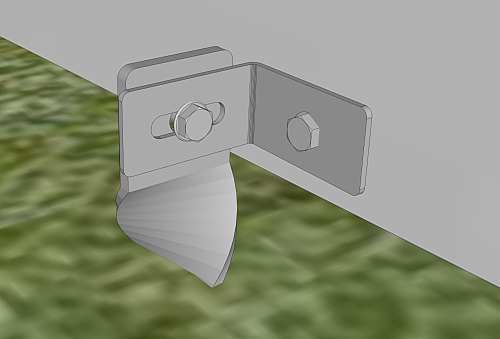 If the shelter needs repositioning, the anchors are simply unwound, the shelter moved to the new location, then the anchors are again hammered through the slot in the brackets. They can be re-used many, many times. 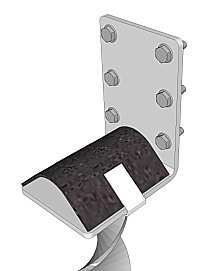 Low Profile anchor and T505 bracket. 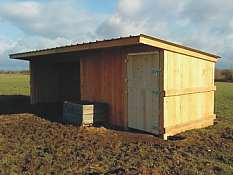 Static field shelters or horse shelters are often used without a concrete base, thus they can be delivered to site, dropped in place and used straight away, however, gravity alone is not normally enough to safely keep them in place. 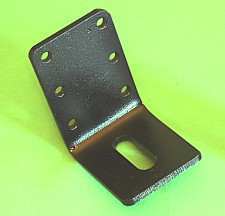 The standard Erdanker range is ideal for securing shelters, fitting them is quick and easy: Hammer in the anchors close to the structure using a sledge hammer, when almost at ground level and with the anchor top in the correct position, bolt an Erdanker bracket to the anchor then bolt or screw the other end of the bracket to the shelter, the bracket prevents further rotation and the shelter is fixed. 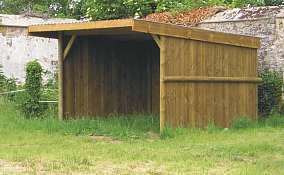 A shelter can be fixed down in minutes and in any weather. Planning permission is not normally needed. 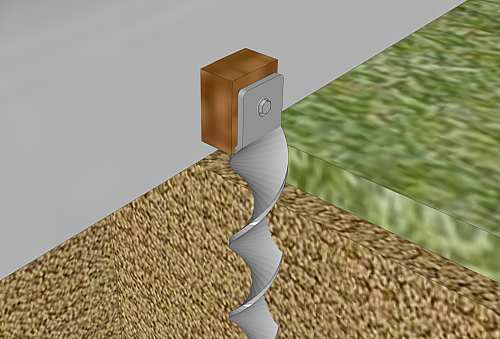 The appropriate anchors are the Erdanker 50x680ED for very hard ground and the Erdanker 50x800 or 50x900 for most ground conditions. A popular bracket is the D505. If the shelter ever needs moving, the anchor can be unwound and both anchor and bracket can be used again, but the hole in the shelter will have to be redrilled. 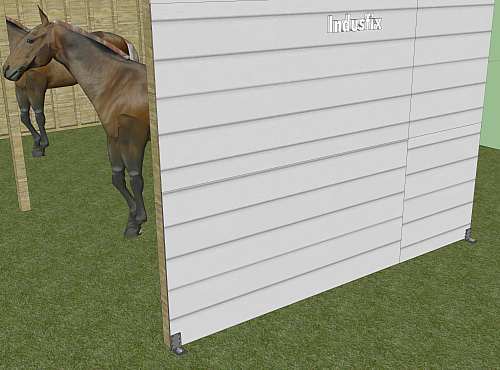 The standard Erdanker anchors can be fitted to shelters using any of the following brackets: A506, B503, D505, The most popular bracket for horse shelters is the D505, illustrated below. The appropriate anchors are the 50x800ED and the 50x900ED. 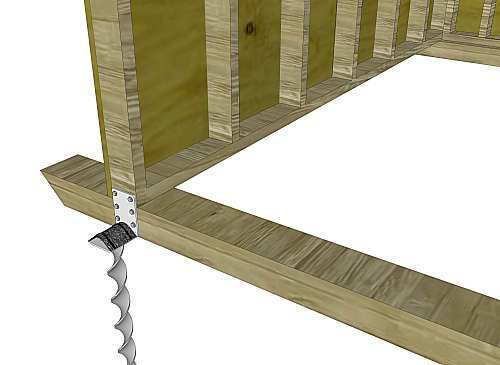 It is possible to use the standard anchors without any metal fitting. Hammer the anchors in close to the shelter, then make a small timber spacer and bolt through the anchor, the spacer and the shelter with a long bolt. As in the illustration below.